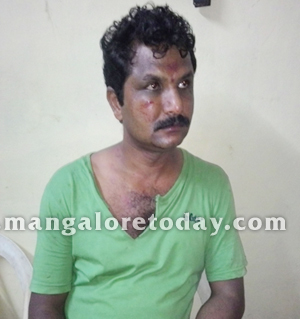 Udupi, Jul 7 2015: A jewellry shop owner in Padubidri was attacked by a panchyat member . Satish Acharya is the victim.He is the Secratay of Vishwa Brahmana Yuvaka Sangha and a owns a jewllary shop at Padubidri . Satish was attacked by Mahindra,the Panchayat member along with his brother Mayoora and his brother- in- law Dayanand. It is said that Sathish Acharya and Mahindra had a misunderstanding in property matters. Mahindra’s relation with Sathish was not good as Sathish supported Seetaram, a BJP candidate in recent Panchayat elections. Mahindra was deadly against Sathish for this reason, was waiting for an opportunity to attack. On Sunday July5, late night, Sathish was returning back home after attending a function at Katpady, Mahindra along with his team stopped Sathish’s car and attacked him with dagger. He kicked and pulled out ornaments worn by him and threw it .Sathish was shouting for help , hearing his scream a woman came out . It was shocking to see a man being attacked openly, she pleaded with Mahindra and his team to stop the attack, but they went on .As a result Satish had serious head injuries and was taken to private hospital at Padubidri for treatment. It is learnt that Mahindra Alias Putta is a resident Guddecchi , had many such cases of rowdism in the local area. A case is registerd against him in Padubidri Police station and investigation is going on. Police has to take a strict action in this case and take Mahindra to custody.